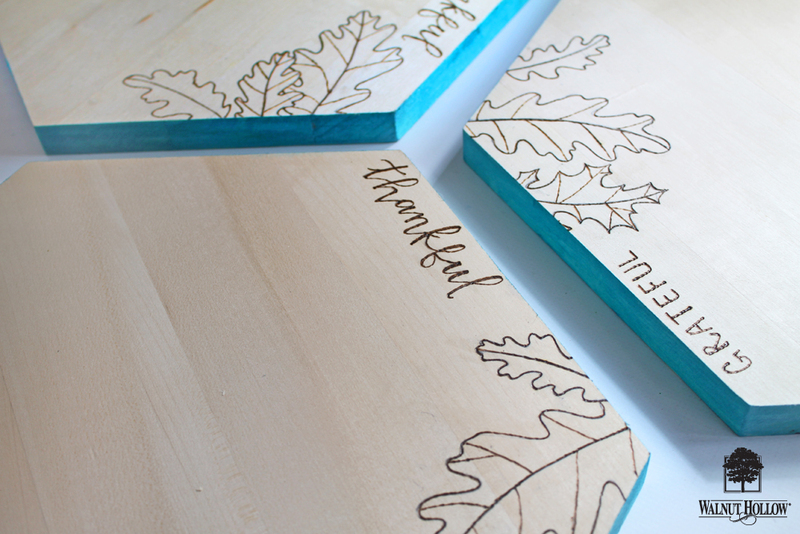 Hello everyone, It’s Katie here and today I’m going to show you how to make some Wood Burned Placemats! These are great for everyday Autumn decor, but the Hexagons will also bring a fun, modern touch to your Thanksgiving Tablescape! 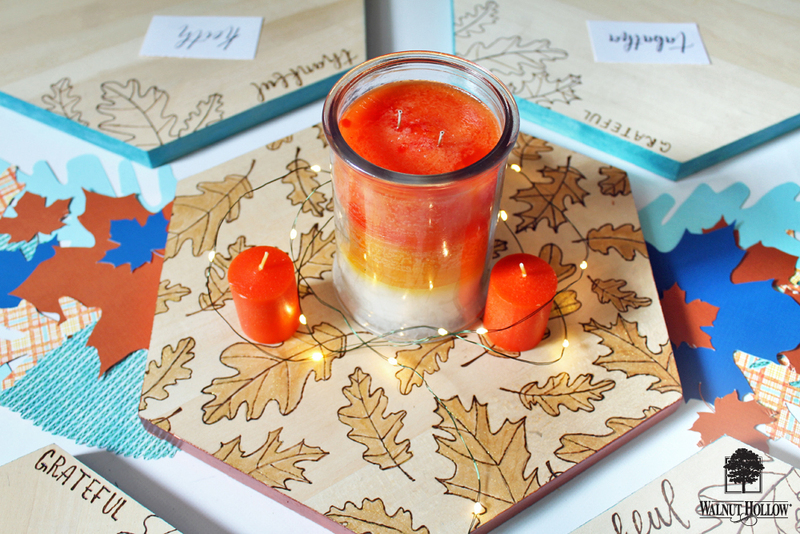 Today I’ve got 2 versions of my project, a candle mat with a more detailed Leaf design, and a few placemats with a simpler design. 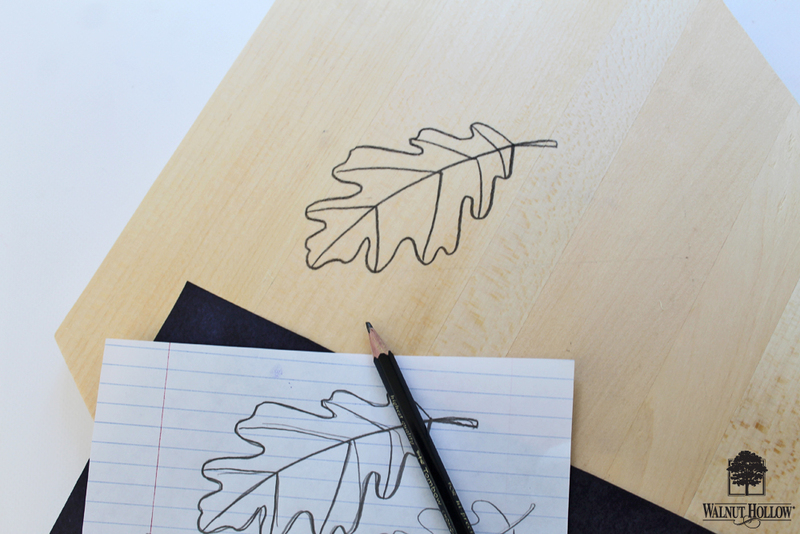 On a piece of paper, sketch out the leaf shapes you want in your design. 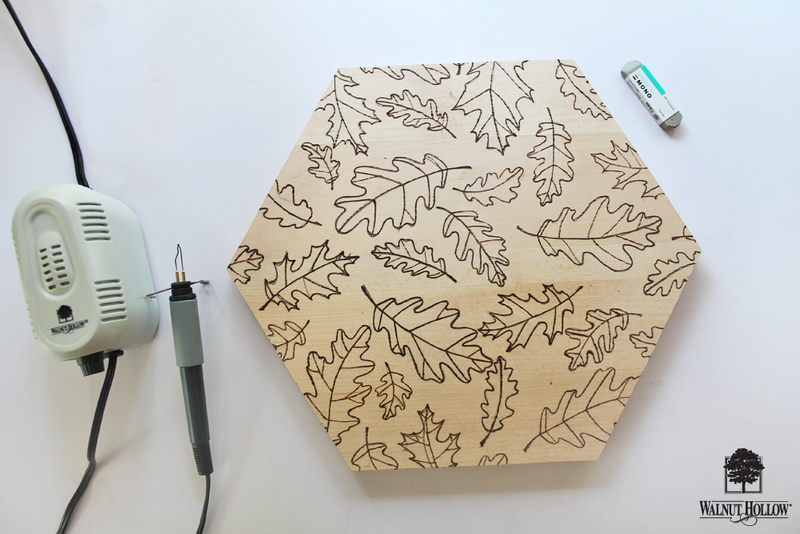 Place a piece of transfer paper (included in the New Creative Woodburner kit) onto your wood hexagon, and your leaf template over top. 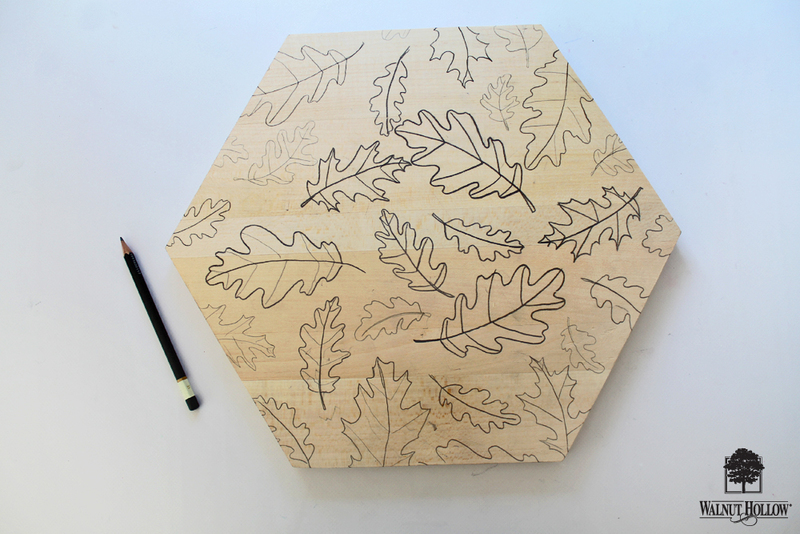 Trace your leaves, transferring them over to the wood. Use your Creative Woodburner to burn over top of your transferred designs. Once finished, use a sand eraser to erase and pencil lines that still show. 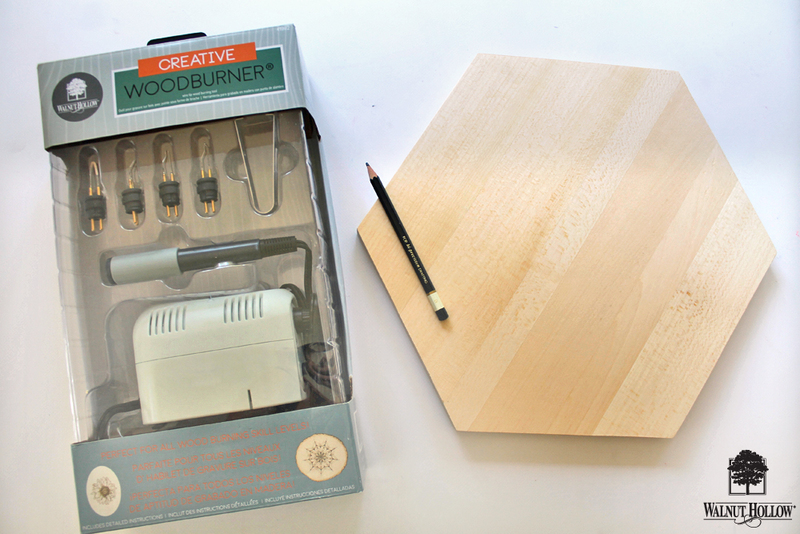 Walnut Hollow’s new Creative Woodburner is my favorite new hot tool! It’s 4 interchangeable nichrome wire tips are perfect for doing more precise burning. For this project I used the Ball Point tip, which was really easy to control and do the curved lines of the leaves with. 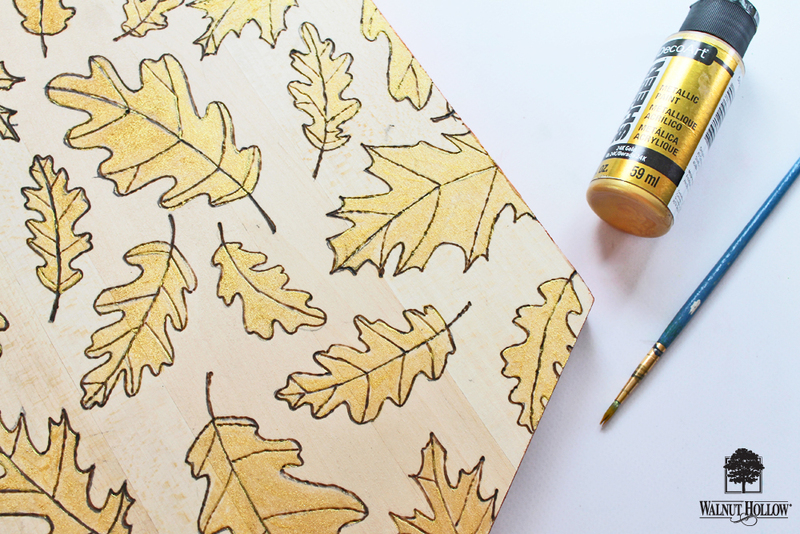 With a small paint brush, paint metallic gold paint into the leaves. You’ll want to be careful and not brush into your woodburned lines. For the placemats I burned 3 leaves onto 1 corner of each hexagon shape, and also woodburned on the word Grateful or Thankful onto each one. My thanksgiving color scheme is more modern this year, with oranges, golds, and turquoise, so I added a pop of color to the edges of the hexagons with acrylic paint. To finish your tablescape, create a tablerunner of colorful paper leaf diecuts, and add some fragrant Autumn candles to your candlemat. Some fairylights also add a bit of whimsy to your decor! 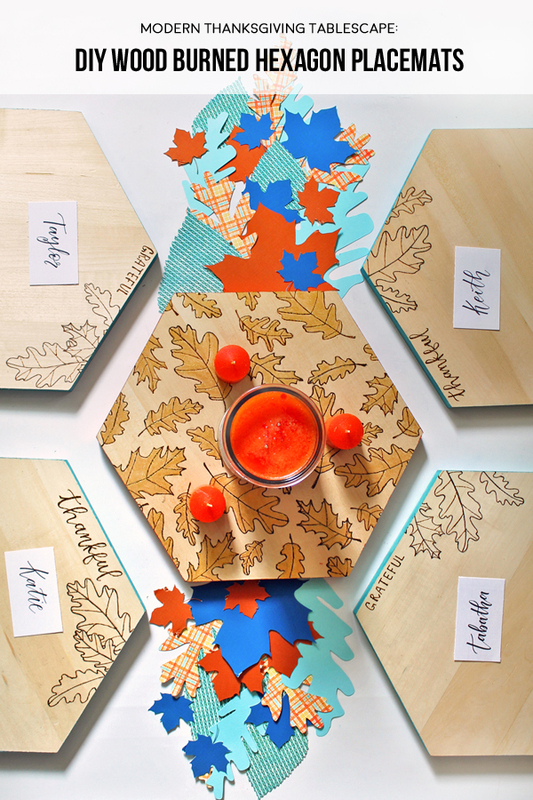 Add your hexagon placemats and you have a lovely modern Thanksgiving tablescape! Will you be decorating for Thanksgiving this year?